For his Seattle debut, 35-year-old Ben Butler presents three large floor-based sculptures, four pedestal or wall-mounted works, and a selection of eight ink-on-vellum drawings. A former student of John Bisbee’s at Bowdoin College now living in Memphis, Butler shares Bisbee’s accretive technique of assembling hundreds of similar elements into an irregular whole. The results are dynamic and unusual. Without recourse to specifically identifiable shapes, Butler’s objects nonetheless allude metaphorically to natural forms. Far from Minimalist or industrial in appearance, they twist and turn, oscillating into assemblages that, like Bisbee’s, end up with the whole being greater than the sum of its parts. Thus, "Specimens" includes seven separate sections positioned laterally across a 15-foot area, as if a collection of arrested tumbling tumbleweed. Executed in variegated colors of glued-and-nailed cedar shingles, it joins two smaller works of white poplar, "The Other I" and "The Other II," which confine their twisting torques to five turns around a central spine. The wall mounted "Crust" has horizontal bandings of cedar that emulate geological sediment but do not hide their woody appearance; Butler is making wood do things one thought it wasn’t capable of doing. Never illusionistic, however, "Crust," like all the other works here, asserts a frank and unadorned materiality. "Scholars’ Rock" is a tour-de-force of cut-and-grooved white aspen and cedar in a six-foot-high upright curve. Real scholars’ rocks, those of the Chinese mandarins, were never this tall, but Butler creates the same effect: an irregular natural shape interesting enough to invite contemplation. Shaped like a sail, "Beat and Pitch Maquette" lifts one end off the pedestal, gracefully elevating its see-through, lattice-like body. "Rounds" is denser and more unitary than "Specimens." 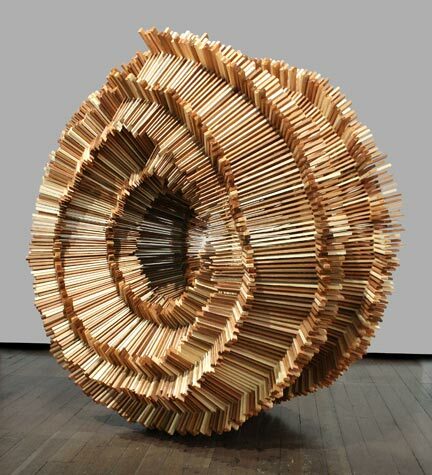 A shift away from some of Butler’s more dispersed installations (not on view), its inner hole is an energy locus for the spiraling and radiating cedar sticks that repeat the color contrast and banding motif of "Crust." The eight drawings, titled "Inventions," are marvelously ethereal and evocative of plant and cellular forms. But they are systematic in the manner of Agnes Denes. Closest to nature among the works on view, they portray dangling threads, clustering seeds, evanescent blobs and an entire vocabulary of bulging, growing shapes that reinforce the outward movement of the sculptures. Once executed in wood, however, the sculptures drop most of the drawings’ movement, stabilizing into stabs at monumentality.